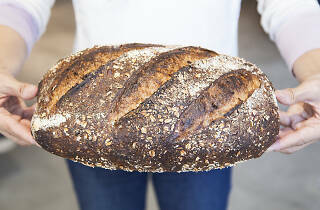 Tartine and Chris Bianco’s Manufactory complex is now open. Here’s everything you need to know. Worldwide icon-chevron-right North America icon-chevron-right United States icon-chevron-right California icon-chevron-right Los Angeles icon-chevron-right Tartine and Chris Bianco’s Manufactory complex is now open. Here’s everything you need to know. We knew the Manufactory was going to be big: the kind of “big” that only happens when some of the country’s most renowned chefs collaborate, the kind of “big” that brings a world-famous bakery to L.A., the literal kind of “big” when a project builds out 40,000 square feet in one of the city’s fastest-developing complexes. We knew what to expect, in theory, but seeing the Manufactory in action is another story. Housed in a warehouse at ROW DTLA in the Arts District, the Manufactory is finally here, the brainchild of San Francisco’s Tartine owners Chad Robertson and Elisabeth Prueitt, acclaimed Arizona pizzaiolo Chris Bianco, plus Coffee Manufactory and Califia Farms. Lines begin to form at 7:30am for fresh pastries and almond-milk lattes at the walk-up window. Dishes of roasted, braised and stewed meats travel from Tartine Bianco’s kitchen and into the while-tiled and wood-tabled dining room. Dozens of bakers knead some of the world’s best bread dough, while passersby sneak a peek from the walls of windows that line the bakery. And, as we mentioned in November, this is just the beginning—set to open in phases throughout the year, the sprawling campus has even more up its sleeves. No wonder why it’s one of our most anticipated openings of 2019. Here’s our guide to everything you can visit and taste in the Manufactory now, and what you can look forward to trying in the coming weeks. In need of grab-and-go coffee, not to mention some of our new favorite pastries in the city? The Manufactory’s walk-up window features classic Tartine cakes and scones—and soon, croissants—from 7:30am to 4:30pm, or until they sell out for the day. There are rye chocolate teacakes, ginger tortes, bacon-and-chive scones and the mini-mountains of cocoa-nib rochers, all just waiting in the window—plus lunchtime sandwiches. Soon enough you can catch house-made soft-serve, swirled from the window in flavors like coffee, salted caramel and fior di latte. The Manufactory’s first full-service restaurant is already up and running, available for dinner service nightly. Soon to follow is breakfast and dinner, transforming the space into an all-day café where you’ll be able to snack on Tartine’s famous smørrebrods—we’re talking avocado, uni, chicken, smoked trout, you name it—and toasts smeared with the likes of chicken liver or beef tartare. For dinner, expect seasonal, heartier fare such as braised pork shoulder, lamb shank, whole fish and shelling-bean stew. Tartine Bianco’s bar program is the mirror image of San Fransisco’s, so expect the same culinary-inspired cocktails you’d find up north. There’s a focus on small-batch and craft spirit producers here, as well as fermentation: The bar is working with the kitchen to reduce waste, utilizing scraps to build out a “fermented” section of the drinks menu. The Violet Revolver, for instance, combines currant kefir with Lillet, Rhine Hall Distillery’s mango brandy, preserved huckleberry and house cordial, while there’s a house-made ginger kombucha that can be stirred with your choice of spirit or amari. There’s a certain energy to the bakery here: There’s calm but extreme efficiency as industrial-size mixing bowls of dough get tipped onto massive tables. 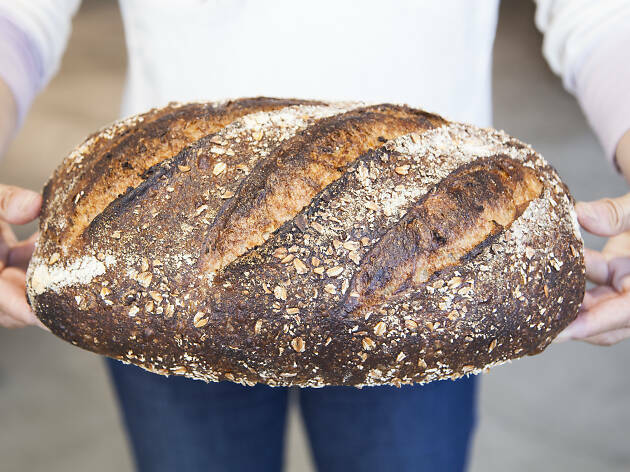 Everyone has a task, forming Tartine’s famed breads into loaves that will wind up in the market, in the restaurants and throughout L.A. Within the Manufactory’s spacious bread bakery, there’s a 50-foot-long proofing tunnel (naturally), as well as a nine-deck oven, where each of the decks can be programmed to different times and temperatures. The team isn’t baking at capacity just yet, but the maximum output is estimated to be somewhere around 4,250 loaves of bread a day, and 6,300 pieces of croissants, viennoiseries, etc.—for those keeping score at home, that would translate to around four tons of flour used each day. You can look, but you can’t touch: The 6,000-square-foot space beneath the main floor serves as the in-house bean roaster for both Califia Farms and Coffee Manufactory. You can peek in to watch the coffee process in action, from cleaning to roasting to bagging, but unfortunately—just like the bakery—this section of the Manufactory is closed to the public. The setup includes a gargantuan, refurbished 1961 120-kilogram Probat coffee roaster, which can roast 70,000 pounds of beans per week—that’s more than 3 million pounds of coffee annually. These beans will make their way into Califia Farms’ coffee products (think: bottled cold brew and lattes), as well as Coffee Manufactory retail bags, all of which should be available for sale around the Manufactory campus. Situated smack-dab between the market and Tartine Bianco’s dining room, there’s a small, low counter with a simple menu of bites, breads and, of course, wine. The Market Bar is meant to be a quick-hit stop for a glass of wine or beer and Pintxo-style charcuterie, tinned fish and cheese, with only a handful of options available for each. For wine, expect two or three varieties, charged based on the amount consumed—but if you’re craving something from the Tartine Bianco or Alameda Supper Club lists (more on that later), that can be arranged. This is also where you can find the flatbreads, L.A.’s own version of Chris Bianco’s famed Pizzeria Bianco pizzas. This is where we say “shut up and take our money”: The Manufactory market, sitting between the walk-up window and Tartine Bianco, is packed with shelves upon shelves of brass spoons, cookbooks, custom ceramics, aprons, linen napkins, imported tinned goods, artisanal salts, olive oils and everything else we’d like to stock our homes with. And in addition to the pantry items, there’s also a range of prepared foods: cut-to-order cheese, meats, pints of their house-made ice cream, and of course pastries, cookies, soups, sandwiches and salads—not to mention custom, whole cakes and tarts available for order. There’s also a bit of a bottle shop, where you can flip through a leather-bound “wine field guide,” which features in-depth information on the varieties available. While Tartine Bianco is a marriage of chefs Robertson and Bianco, it’s far more similar to Robertson’s Tartine than Bianco's Arizona enterprise. Alameda Supper Club, situated on the other side of the building, is more Bianco’s turf. This menu is Italian-leaning, a little more formal, but still involves both chefs. During the week, Alameda Supper Club is dinner-only, with weekend brunch available, to boot. Some of the walls are even dotted with art from Bianco’s own father. Want the amari-tinged cocktails of the Supper Club, but alfresco? Alameda Cocktail Club, the restaurant's gorgeous adjacent patio bar, features 12 bar stools, a 20-seat pergola flanked by plants, and a unique snack menu—so needless to say, we’re already planning our summer patio drinking. Think science, but drinkable: Built as a communal space, the Coffee Lab is where the coffee curious and connoisseurs alike can learn all about the brew process and how the caffeinated magic happens, plus try cupping, sample unique roasts that aren’t always available for purchase, and even take part in a Specialty Coffee Association-approved workshop or class on brewing, roasting, barista skills—you name it. It’s set to be the first Specialty Coffee Association flagship educational campus in the country, ideally making these often hard-to-find courses accessible for Angelenos. The marriage of Coffee Manufactory and Califia Farms, this is where you can find a small retail section for both brands’ goods, plus the occasional guest roaster takeover, importer event and competition, such as something like the U.S. Coffee Championships qualifiers. Look for this to launch sometime later this year, hopefully by summer.